Due to optimized gearing and improved bearings in the housing cover a minimum effort is required to operate the short hand lever. Steel hand wheel as standard. Automatic screw-and-disc type load brake with corrosion protected components. 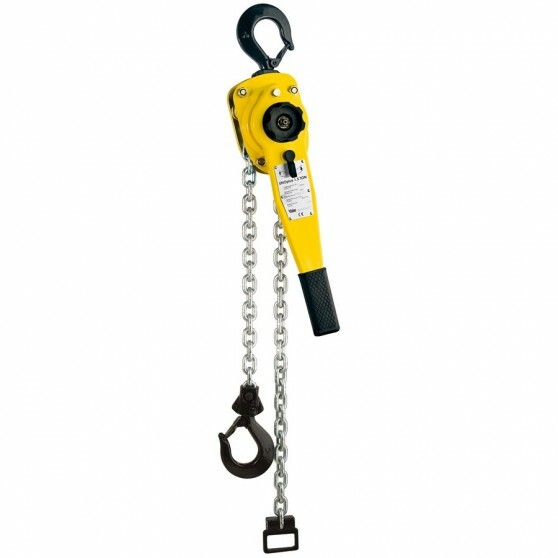 Standard free chaining device to quickly attach the load or to pull the chain through the hoist in both directions. Robust chain guide rollers eliminate fouling and jamming of chain on the load sheave. Alloyed steel link chain with zinc-plated resp. yellow chromated finish, in accordance with national and international standards and regulations. Drop forged suspension and load hooks are made from non-aging, high tensile steel and fitted with robust safety latches.